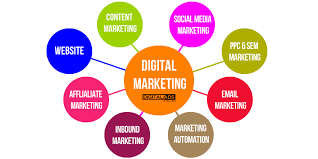 Digital marketing is a mode of marketing of products, services and brands using internet and other digital technologies. Through different digital channels and strategies of digital marketing, the information of any business, brand, products and services is taken to potential audience and it finally converts leads into customers. Digital marketing tremendously depicts the marketing carried out through internet-powered computing devices, mobile, radio and TV. Digital tools and social media platforms through Internet and mobiles are popularly known as core potential medium of digital marketing. Digital Marketing also extends to some activities like as SMS, MMS, ringtones on mobile phones (non-internet channels). Search Engine Marketing is one of the primary forms of internet marketing. Its process involves business websites’ promotion to increase its visibility in search engine result pages especially through the paid advertising. Search Engine marketing may incorporate SEO also to some extent. Search Engine Optimization is a process to rewrite website content and post it on different content platforms building one or two links of the website to increase website’s visibility in search engines. The process is followed to take the website to higher ranking in search engine results pages so that its pay per click listings may be enhanced. Affiliate Marketing is a type of digital marketing based on performance. In this process of marketing, business owner rewards affiliates for each customer or visitor brought by the affiliates’ marketing efforts. In this industry there are four players-First-merchant (retailer or brand or business owner), Second-the Network which brings offers for affiliates from different merchants and takes care of payments), Third –publishers or affiliates who publish the advertisement or ads on their website to promote the products or services, Fourth- the customer who comes to buy products or services through the website of affiliates. Affiliate marketing itself overlaps with some other Internet marketing ways to some extent, because affiliates majorly use digital advertising methods regularly. Those effective methods include organic search engine optimization (SEO), techniques of paid search engine marketing (PPC – Pay Per Click), content marketing direct e-mail marketing and in some sense display advertising. Affiliates sometimes also use techniques like as publishing reviews of services or products offered by their merchant-partner. Social Media is an internet-based electronic tool allowing users to generate, publish, exchange, share and access information through mobile and computing devices. Indivisuals, organizations, businesses or every user publish or access the content in the form of text and visual information in social communities and networks like as facebook, twitter, linkedin and many others. Social Media Optimization (SMO) refers to optimizing a website and its content across social media and networking sites. It is an effective way of digital marketing. In this process, a number of social media outlets and communities are used to create publicity and awareness of a product, business, brand, service or event. Techniques of Social Media Optimization include the use of social news and bookmarking sites, RSS feeds, as well as social networking sites, such as Facebook, Twitter, and video and blogging sites. How is Social Media Optimization Similar to Search Engine Optimization? The purpose of SMO is similar to that of search engine optimization. The common goal of both is to create publicity awareness for a website and generate traffic to it. Content marketing is a type of internet marketing focused on creation and distribution of valuable information content to increase the awareness of products or services in different channels on the internet. Valuable content with genuine information attract targeted audience and convert them to them into customer. Influencer marketing is a form of marketing emerged from a variety of recent studies and practices. In this kind of marketing focus is placed on specific key individuals rather than the target market as a whole. It identifies the individuals who have influence over potential buyers, and orients marketing activities around these influencers. These influencers may be potential buyers themselves or third parties. These potential third parties come either in the supply chain like as retailers, manufacturers, etc. or may be value-added influencers like as academics, journalists, industry analysts and professional advisers. Influencer Marketing is becoming an important concept in digital marketing. Through paid advertising, such as Facebook Advertising or Google Adwords campaigns, it is possible to reach influencers. Sophisticated SCRM (social customer relationship management) software including SAP C4C, Sage CRM, Microsoft Dynamics and Sales force CRM is also used. Direct E-mail Marketing is an effective mode of marketing. It is email-based campaigns in which advertisements or proposals are directly sent to a targeted audience. The messages in the form of written text, HTML, or rich media, seem to be Web-based ads. Various elements make direct email marketing different from spam email campaigns. Display Advertising is also a form of online advertising that includes banner ads, rich media and more. The way of display advertising relies on effective visual elements including graphics, images, audio and video to convey an advertising message to targeted audience. A marketing campaign is a coordinated series of various advertising activities designed to promote a brand, business, product, service or event. Along with all latest advertising techniques; word of mouth, demonstration and other interactive techniques are also used for promotion. In the modern world of digital marketing, E-commerce marketing is referred to as the practice of directing online buyers to any particular e-commerce website and making them ready to buy the products or services online from it. E-commerce marketing includes some latest marketing trends such as: Search engine optimization, Affiliates marketing, referral marketing and banner advertising and E-mail marketing. What is an E-Book and E-Book Marketing? An electronic book commonly known as E-book, eBook, digital book or e-edition is a book-length publication in digital form. Like printed books, E-book can also consist of text and images that are readable on tablets, smart phones and computing devices. E-books commercially produced and sold are usually read on dedicated e-readers. These e-books are generally used as an effective marketing strategy to enhance the awareness of the products and services. ← What is Search Engine Optimization (SEO)?